Have you seen condom before? A lot of people have easily disclosed that the first time they saw condom in their life was when certain agencies came to their school and distributed some condoms to them. What is the effect of condom distribution to society? This is our delicious topic in monicdiarys.blogspot.com herein. Read more: why should condom and contraceptives be distributed in secondary school ? 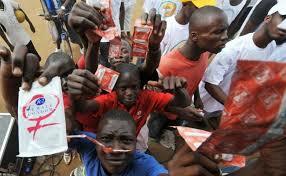 No doubt,organizations in charge of HIV/AIDS control have good intentions for distributing condoms to public. Their beautiful intention is to control the spread of HIV/AIDS in society through the use of condom. But come to think of think,if condom is given to you,will you be tempted to use it or not? Some people say yes,in fact,seeing condom made them to engage in immoral conduct with people of opposite s*x. This is a very big negative effect of condom distribution in society. From an interview with elderly people who are in their late 60s and 70s,we asked them if s*xual immorality was as rampant in their time as it is in our own time today. The answer they all gave was in negative. they said NO. When we asked them again if condoms distribution was in their time as it is in our own time today,and again they say NO. After our analysis,we came to conclude that condom distribution to society has really contribute to influx of immorality as we have today in society. Come to think f it: If people know that by being unfaithful to their partners in bed ,they would contract HIV/AIDS,do you think they will engage in any immoral conduct that would warrant that? Definitely no. But having an easy access to condom when it is being distributed by HIV/AIDS control agencies,have made it easy for people,especially youths to engage in immoral conduct. This again is another negative effect of condom distribution to society. The effects o condom distribution in society are negatives. It has never done much good than harm to people,especially the vibrant youths we have in our society,trying to use anything they are given to do practice!! Worst of it all,the use of condom does not give 100% assurance that the user won't contract any s*xually transmitted diseases so common today. By stopping the distribution of condom to people in society,HIV/AIDS control agencies will do the society a lot of good than harm!! !